Western blot analysis of total SW480 cell lysates using Non-phospho (Active) β-Catenin (Ser33/Ser37/Thr41) Antibody in the presence of a non-phospho-β-catenin peptide (Lane 4) and various peptides phosphorylated at different positions, including phospho-β-catenin (Ser33) peptide (Lane 1), phospho-β-catenin (Ser33/37) peptide (Lane 2), phospho-β-catenin (Ser33/37/Thr41) peptide (Lane 3), phospho-β-catenin (Ser37) peptide (Lane 5), phospho-β-catenin (Ser37/Thr41) peptide (Lane 6), and phospho-β-catenin (Thr41) peptide (Lane 7). Non-phospho (Active) β-Catenin (Ser33/37/Thr41) Antibody (lower). 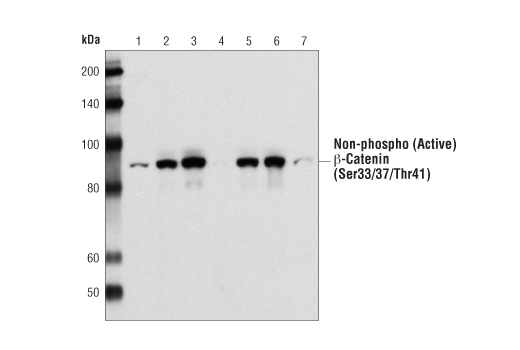 Non-phospho (Active) β-Catenin (Ser33/37/Thr41) Antibody recognizes endogenous β-Catenin when residues Ser33, Ser37, and Thr41 are not phosphorylated. It does not detect β-Catenin if tri-phosphorylated at Ser33/Ser37/Thr41. 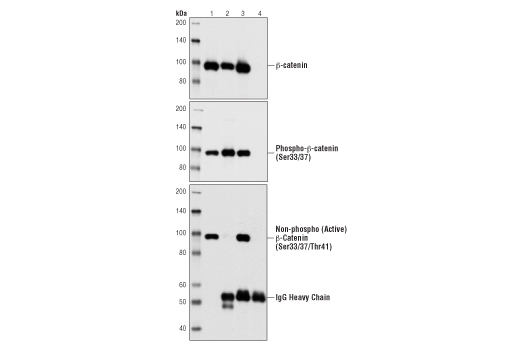 This antibody may also detect β-Catenin protein when singly phosphorylated at Ser33. This specificity data was derived from competition ELISA and dot blot analysis using synthetic peptides. Polyclonal antibodies are produced by immunizing animals with a synthetic peptide corresponding to residues surrounding Ser37 of human β-catenin. Antibodies are purified by protein A and peptide affinity chromatography.